Before any evidence is taken today I need to refer certain to media reports concerning my holding certain shares in Cement Roadstone Holdings. After the conclusion of yesterday’s Sittings of the Tribunal I was informed by my Registrar that she had been approached by a Journalist from the Irish Independent who handed her a copy of an impending article in Magill Magazine. The journalist asked for my comments on the article. At the time I decided that I would make no comment until I had examined the article and having done so I have decided that I should make this statement. The article states that according to the most recent register of shareholders I hold 34,500 shares in CRH worth approximately £500,000. It goes on to say that a Mr Michael Anthony Moriarty registered at the same address holds a further 2,000 shares worth approximately £28,000. I am the Michael Anthony Moriarty referred to. I hold no shares in CRH as of this moment. However, although I have not had an opportunity of examining the most recent register of shareholders I feel certain, having regard to some facts which I will set out below that the most recent register of shareholders identifies shareholdings in my name to the extent of 36,500 shares. I should say that I was not aware of the Magill Magazine article until it was drawn to my attention by my Registrar yesterday afternoon. 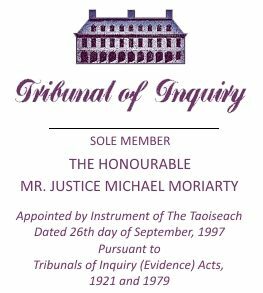 The article goes on to say that “Des Traynor’s involvement in CRH would be excluded from investigation by Moriarty should any matters arise that merit investigation in the context of the Tribunal’s Terms of Reference”. It also refers to the fact that this Tribunal was established in September of 1997 and that during the Dail debate on the Tribunal’s terms of Reference there were calls from the opposition to have the Glen Ding sale included in the Tribunal’s remit but that these were rejected by the Government on the grounds that they did not wish to tie the Tribunal’s hands with a prescriptive list of matters to investigate. I know little of the detailed circumstances surrounding what has been called the Glen Ding sale. I have been aware however and was certainly aware at the time of the Dail debate of certain controversy concerning the Glen Ding sale. I was certainly aware of the CRH involvement in Glen Ding at the time I was asked to accept an appointment as Sole Member of this Tribunal. At that time I realised that if what has been called the Glen Ding sale emerged as a matter requiring to be investigated in the course of this Tribunal’s work there would be a risk that I would be perceived as having a conflict of interest in view of my shareholding in CRH. Therefore before considering whether to accept the appointment I brought the fact of my then shareholding in CRH to the attention of the Attorney General, Mr David Byrne Senior Counsel. Having done so it was agreed between myself and the Attorney General that he would bring this matter to the attention of the leaders of the political parties, including the Taoiseach, before I would consider accepting the appointment. I asked the Attorney General to confirm to me the results of his notification to the party leaders. The Attorney General subsequently informed me that he had spoken to the party leaders and disclosed to them my shareholding in CRH and my apprehension that in certain circumstances this could give rise to a perceived conflict of interest which would preclude my inquiring into certain matters. I was informed by the Attorney General that the party leaders acknowledged that my appointment on those terms would not cause them to have any concern. I also disclosed to then President of the High Court, Mr Justice Declan Costello the fact of my shareholding and the circumstances in which I had indicated I would be prepared to consider accepting the appointment. For some time, for my own reasons I have been contemplating the sale of these shares. I issued instructions last Friday that the shares should be sold and I understand from my Brokers that they were sold early on Monday last, the 28th of this month. Notwithstanding the fact that I no longer hold any shares in CRH I am still firmly of the view that my position regarding the investigation of any matter concerning that company is the same as it was at the time of my appointment. I am satisfied that my having held any such shares precludes my inquiring into any matter concerning either Glen Ding or Cement Roadstone Holdings. I should say that had I disposed of my shareholding prior to my accepting the appointment as Sole Member of this Tribunal I would nevertheless still have felt under an obligation to bring the matter to the attention of the Attorney General and to the attention of the leaders of the political parties before considering accepting any such appointment. Evidence was given at the Sittings of the McCracken Tribunal, and at the Sittings of this Tribunal that the late Mr Desmond Traynor, as Chairman then of CRH was entitled to an office in the company’s premises at 42 Fitzwilliam Square, Dublin and that from that office he conducted certain activities unconnected with his role as Chairman of CRH. I have heard evidence during the proceedings of this Tribunal that the activities of Guinness Mahon Cayman Trust, the operation of which has been described in the McCracken Tribunal as the Ansbacher accounts, were conducted by Mr Traynor and other persons acting under his instructions from that office. I do not regard myself as being in any way precluded from continuing to inquire into the conduct of what I have been told are banking activities from those offices at 42 Fitzwilliam Square. Having made these few remarks, I am anxious to resume normal transmission straightaway as regards Tribunal business.